Eating free from food doesn’t always deliver but these award winning garlic baguettes certainly do. A slow proved and gently part baked crusty baguette with a soft doughy interior, sliced and filled with garlic and parsley spread. 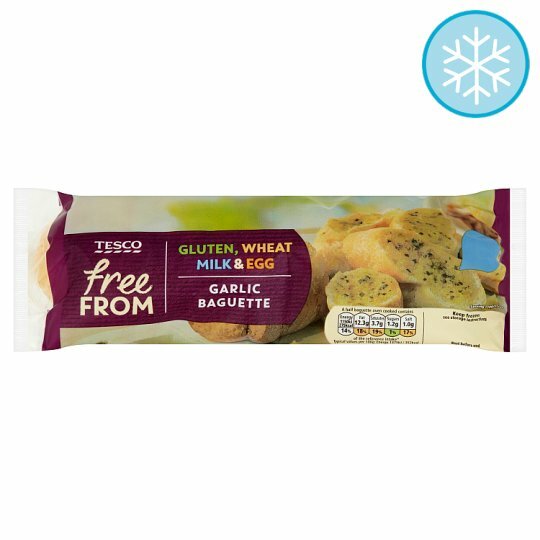 Bake straight from frozen to give a golden baguette oozing with a delicious garlic filling. Eat on its own as a snack or to accompany a chilli or your favourite Italian meal. Potato Starch, Garlic Spread (25%), Water, Rice Starch, Thickeners (Hydroxypropyl Methyl Cellulose, Xanthan Gum, Guar Gum), Sugar, Yeast, Salt, Psyllium Husk Powder, Rapeseed Oil, Yeast Extract, Lentils, Acidity Regulator (Sodium Acetate), Enzymes. Garlic Spread contains: Margarine, Garlic Purée, Water, Parsley, Rapeseed Oil, Salt, Onion Powder. Instructions: For best results cook from frozen. Remove all packaging. Place on a baking tray in the centre of a pre-heated oven for 12 minutes or until golden brown.